This document (together with any documents referred to in it) tells you the terms and conditions on which we (Home Maid Clean) supply any of our cleaning services (Services), described on our website (www.carpetcleaninglondonagency.co.uk)..Please read these Terms and Conditions (Terms) carefully and make sure that you understand them before ordering any Services from us. You should understand that by ordering (via our website, by telephone, email) any of our Services, you agree to be bound by these Terms. You (The Client) should print a copy of these Terms for future reference. If you refuse to accept these Terms, you will not be able to order any Services from us. 1. These Terms will become binding on you and us when we confirm to you by email that we are able to provide you with our services and we have accepted your order (Order). At this point a contract will come into existence between you (The Client) and us (Home Maid Clean). Where the Client has requested the Services and Home Maid Clean has discussed with the Client his requirements by phone or email and the Client agreed to proceed with the Order, Home Maid Clean will confirm the acceptance of the Order to the Client by sending him an email (Email Confirmation). The contract between the Client and Home Maid Clean is made when Home Maid Clean send him the Email Confirmation. 2. If any of these Terms conflict with any term of the Order, the Order will take priority, unless the conflict relates to clause 6 (our liability to you), which will take priority. 2.1 Home Maid Clean may revise these Terms from time to time in order to comply with changes in relevant laws and regulatory requirements or when we carry out an annual review of the rates you pay for the Services. 2.2 If Home Maid Clean revises these Terms under clause 2.1 then Home Maid Clean will give the Client at least one month’s written notice of any changes to these Terms before they take effect. You can choose to cancel the contract in accordance with clause 7. 2.3 The Client may make a change to the Order for Services at any time before the start date for the Services by contacting Home Maid Clean at least 24hrs prior to service takes place. Where this means a change in the total price of the Services, Home Maid Clean will notify the Client of the amended price in writing. 2.4 If the Client wishes to cancel an Order before Home Maid Clean begins to provide him with the Services, please see the Client’s cancellation rights to do so in clause 8. (b) Home Maid Clean will try its best efforts to send the same cleaner on each occasion, but sometimes another cleaner can come when your cleaner is sick or on a holiday. (c) The Client agrees to give at least 24 hours advanced notice when he wants to cancel or re-schedule a visit. (d) The Client will not without our prior written consent at any time during the period from the date of 18 months after the date of termination or expiry of the contract between us (as the case may be) solicit or endeavour to entice away from or discourage from being employed by us any of our employees or sub-contractors engaged in providing the Services. Any consent given by us in accordance with this paragraph shall be subject to the payment by you to us of £1500 per employee or sub-contractor. (e) For a regular domestic cleaning (and one-off cleaning when the Client chooses to provide the cleaning materials) the Client agrees to provide all cleaning materials and equipment in good and safe working order to allow Home Maid Clean to perform the Services. If the Client does not provide any or all of the cleaning materials required, Home Maid Clean may purchase them on his behalf. The Client has to pay the costs of such cleaning materials, plus an additional service charge. 3.2 For one-off cleaning services when the Client requests Home Maid Clean to provide the cleaning materials and the equipment, he agrees to pay an additional charge for the materials and equipment delivery. (a) The fees for one-off Services are charged per hour, taking into account the current condition of the premises, the number of rooms, bathrooms, showers and WCs. 3.3 The flat rates for End of tenancy cleaning and After Builders cleaning do not include the following services: dishwashing, removing more than 5 items from cupboards for cleaning and replacement, dusting books, cleaning external spaces (such as balconies, terraces, patios and gardens), cleaning of venetian blinds and should the Client require any of them an additional charge will apply. 3.4 All quotations made in writing by Home Maid Clean shall be valid for 30 days. We reserve the right to change our prices if the Client original requirements change. 3.5 Our quotations exclude the costs of clearing any debris created by tradesmen or building work unless otherwise agreed by Home Maid Clean. 3.6 The quotes that Home Maid Clean provides are based upon average times taken to clean homes of a similar size, but the Client understands that it is difficult to predict actual timings with certainty and some degree of flexibility will be required. Sometimes After building cleaning, End of tenancy cleaning and the cleaning of badly neglected properties may take up to three times longer than for cleaning a well-maintained home on a regular basis. 3.8 Home Maid Clean will provide all cleaning equipment and solutions for steam cleaning services. The Client will be responsible for providing running hot water and an electricity supply. 3.9 Parking and Congestion charges – The Client should provide a parking space at his address. The Client agrees to pay any Congestion charge and parking charges, where there is not free roadside or off-road parking. 3.10 Keys – When Home Maid Clean’s operative has to collect keys from or deliver keys to an address more than 500 metres from the address at which the Services are to be performed, we reserve the right to levy an additional charge of £10 for each collection and a further £10 for each delivery. If the wrong keys are provided, a further charge of £10 will be levied. Home Maid Clean is not responsible for any faulty keys/locks. 3.11 When a customer privately hires one of our cleaners without letting us know (orally or written) and without any consent given by us shall be a subject to the payment to us £ 1000 per employer. 4.1 The price of Home Maid Clean will be set out in the price list in force at the time we confirm your Order. Our prices may change at any time, but price changes will not affect Orders that we have confirmed with the Client. 4.2 Home Maid Clean reserves the right to review the prices for the Services. We will give you at least one month’s written notice of any changes to our rates before they take effect. The Client can choose to cancel the contract in accordance with clause 9. 4.3 Payment for the Services is requested upon completion on the day either in cash, bank transfer or debit/credit card payment over the phone. Payment via bank transfer or by debit/credit card shall be done in advance. If payment is made by credit card 4% surcharge will apply. Home Maid Clean will not share the customer’s card details with a third party. 4.4 Payment for regular Services (such as daily, weekly or fortnightly cleaning) can be made in cash, cheque, standing order, Direct Debit or card payment. Home Maid Clean will invoice you at the end of each month for the Services. The Client must pay each invoice within 14 calendar days of the date of the invoice. 4.5 The Client understands that any ‘late payments’ may be subject to additional charges. 4.6 One-off cleaning Services require an advance deposit payment of 50% of the price of the Services payable to Home Maid Clean by debit/credit card. Unless otherwise agreed in writing by Home Maid Clean, the Client must pay the outstanding balance upon completion of the Services straight to the cleaning operative before he/she leaves Client’s premises, either by cash or debit/credit card. If the Client is not present at the time, he agrees and authorises Home Maid Clean to charge his debit/credit card he used to pay the deposit. 4.7 If the Client is paying by cheque and the cheque is returned unpaid, Home Maid Clean will charge the Client a flat rate of £30.00 per cheque. 4.8 If full payment is not received by the due date for payment, Home Maid Clean may charge interest to the Client on the overdue amount at the rate of 4% a year above the base lending rate of Barclays Bank Plc from time to time. This interest shall accrue on a daily basis from the due date until the date of actual payment of the overdue amount, whether before or after judgment. The Client must pay Home Maid Clean interest together with any overdue amount. Without prejudice to our other rights and remedies under these Terms, if any sum payable is not paid on or before the due date, Home Maid Clean shall be entitled forthwith to suspend the provision of Services to the Client until he has paid overdue amounts in full. 4.9 If payment is not made after 30 days of invoice the account will be passed to our debt collection agency. All accounts without exception will be subject to a surcharge of 15% plus Vat on the top of the invoice’s due amount to cover our costs of recovery. 4.10 In the event that the Client requests the Home Maid Clean to provide Services on a regular basis, but cancel such Services after one visit, Home Maid Clean reserves the right to charge the Client the rate for one-off Services. 5.1 Home Maid Clean’s business reputation is based upon the quality of the provided Services. We acknowledge, however, that we do sometimes make mistakes. If you are not satisfied with our Services, we offer to re-clean your premises to your reasonable satisfaction, subject to the remaining provisions of this clause 5. 5.2 All Services shall be deemed to have been performed to reasonable satisfaction unless you notify us in accordance with the provisions of this clause 5.2. Home Maid Clean will fully investigate any complaint and attempt to resolve it to the satisfaction of the Client, or alternatively to a reasonable standard. (a) The Client agrees and understands that any complaint or feedback should be provided in writing within 24 hours from the Services date. Failure to do so will entitle customer to nothing. (b) The Client agrees to give Home Maid Clean an opportunity to repair or fix any damaged items caused by us or to come back to re-clean any disputed areas/items. (c) The Client will not appoint a third party to attempt to remedy any defect, damage or breakage without consulting Home Maid Clean first and any attempt to do so may prejudice your right to require us to remedy, repair or replace items. (d) The Client agrees to allow Home Maid Clean back to re-clean any disputed areas/items or repair damaged items, before making any attempts to clean those areas/items himself or arranging a third party to carry out cleaning or repair services with regards to the above. Failure to do so will void our Company Guarantee and we will consider the matter fully settled. (h) If the Client is not completely satisfied with a cleaning service, Home Maid Clean will return to re-clean any areas and items to customer’s satisfaction. Home Maid Clean may require entry to the location of the claim as soon as possible. (i) The Client agrees to present at all times during the re-clean. Home Maid Clean reserves the right not to return a cleaner more than once. (j) The presence of the Client is required at the end of the cleaning session and he agrees to inspect the work and to draw the operatives’ attention to any outstanding issues before they leave his premises. The operatives will carry out any such additional work to the Client’s complete satisfaction. (k) If the Client instructs a third party to inspect the Services then Home Maid Clean must be notified before completion of the Services. (l) If the Client has scheduled an inventory check then it must be scheduled to commence no later than 24 hours after the cleaning job has been carried out. (m) Home Maid Clean will not accept a complaint based on an Inventory check report, filed more than 24-hour after the cleaning session. 5.3 Whilst Home Maid Clean makes every effort not to break or damage items, accidents do happen. All fragile and highly breakable items must be secured or removed. Items excluded from liability are: cash, jewellery, items of sentimental value (the Client will be credited with the items present cash value), art and antiques. Key replacement/locksmith fees are paid only if our operatives lose keys. 5.4 Please note that Home Maid Clean will not be liable for any damage where caused by faulty materials or installation. Home Maid Clean will assume that all surfaces (such as marble, glass or stone) are appropriately sealed for us to provide our Services, unless the Client notify us to the contrary in writing before Home Maid Clean commence the Services. 5.5 Home Maid Clean will cooperate with all relevant authorities, including insurance companies and/or the police, in the event that Home Maid Clean believes the Client to be involved in the provision of any misleading information, misrepresentation or fraud in relation to any claim. Home Maid Clean shall not be liable under any circumstances for any loss, expense, damage, delay, costs or compensation (whether direct, indirect or consequential) which may be suffered or incurred by the Client arising from or in any way connected with a late arrival of Home Maid Clean’s operatives at the service address. Home Maid Clean endeavours to be right on time on any visit but sometimes due to transport related and other problems which are beyond the Home Maid Clean’s control, our operative’s may arrive with a delay or the cleaning visit may be re-scheduled. 7.1 Home Maid Clean will not be liable or responsible for any failure to perform, or delay in performance of, any of our obligations under these Terms that is caused by an Event Outside Our Control. (b) Home Maid Clean obligations under these Terms will be suspended and the time for performance of our obligations will be extended for the duration of the Event Outside Our Control. Where the Event Outside Our Control affects our performance of Services to the Client, Home Maid Clean will restart the Services as soon as reasonably possible after the Event Outside Our Control is over. 7.3 The Client may terminate the contract if an Event Outside Our Control takes place and he no longer wishes Home Maid Clean to provide the Services. Please see the Client’s cancellation rights. Home Maid Clean will only terminate the contract if the Event Outside Our Control continues for longer than 14 days in accordance with our cancellation rights. The Client may cancel or change an appointment for regular domestic cleaning by giving at least 24 hour advanced notice to Home Maid Clean. The notice can be given either over the phone or via email. All of our incoming emails and messages are checked every day Monday to Saturday from 8 am until 7 pm and Sunday between 10 am and 5 pm. When the Client wants to cancel or re-schedule an appointment and gives Home Maid Clean a notice less than 24 hours he agrees to pay the full rate for the cleaning session. The Client agrees to pay £ 33 fee when we are prevented from carrying out the Service due to: no keys left for the cleaner; nobody is at the property to give the cleaner an access; the equipment provided is faulty or defective; insufficient cleaning materials; or there is a problem with the keys. If keys are provided the cleaner must open all locks without any special efforts or skills. 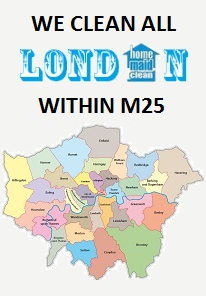 Home Maid Clean’s operatives work on any day of the week including Bank Holidays. If the Client’s cleaning visit is due on a Bank Holiday and he hasn’t called, faxed or e-mailed the Company to cancel the visit 24 hours prior to the start of the cleaning session, the Client agrees to and understands that the regular amount due for that cleaning visit will be charged regardless of whether the cleaner has cleaned the Client’s property or not. The Client agrees to pay £35 cancellation fee when there are no keys left for the cleaner, nobody is at the property to give the operative an access, no hot water/electricity supply or there is a problem with the keys. If keys are provided the cleaner must open all locks without any special efforts or skills. If the Client needs to change a cleaning day or time, Home Maid Clean will do its best to accommodate him. Any changes to booked services are subject to a 24 prior notice and availability. The Client may cancel or change an appointment for End of tenancy (Move-in or Move-out) and After Builders (Post construction) cleaning by giving at least 24 hour advanced notice to Home Maid Clean. The notice can be given either over the phone or via email. All of our incoming emails and messages are checked every day Monday to Saturday from 8 am until 7 pm and Sunday between 10 am and 5 pm. The Client agrees to pay £ 30 fee when there are no keys left for the cleaner, nobody is at the property to give an access, or there is a problem with the keys. If keys are provided the cleaner must open all locks without any special efforts or skills. Home Maid Clean may have to cancel an Order before the start date for the Services, due to an Event Outside Our Control or the unavailability of key personnel or key equipment/materials without which we cannot provide the Services. Home Maid Clean will promptly contact you if this happens. In such circumstances, when Home Maid Clean is unable to provide the Client with the Services, Home Maid Clean will refund the amount of any paid deposit. 9.1 Where Home Maid Clean provides the Services on a regular basis, the Client may terminate the agreement for the Services at any time by providing us with at least 2 week (14 calendar days) notice in writing. The Client agrees to pay a cancellation fee of £ 30 when no notice has been given. 9.2. Where Home Maid Clean is providing the Client with one-off Services, he may terminate the contract for Services by giving Home Maid Clean a written notice at least 24 hours in advance. Any advance payment the Client has made for Services will be refunded to him. (d) Home Maid Clean is affected by an Event Outside Our Control. 9.4 Once Home Maid Clean has started to provide the Services to the Client, Home Maid Clean may terminate the contract for the Services at any time by providing the Client with at least 14 days’ notice for regular Services or 24 hours’ notice for one-off Services. If you have made any payment in advance for Services that have not been provided to you, Home Maid Clean will refund these amounts to the Client. (c) if you are a business, you go into liquidation or a receiver or an administrator is appointed over your assets. 10.1 If the Client has any questions or any complaints, he should contact Home Maid Clean either by phone on 0207 205 25 28; 0800 56 56 39 or via e-mail: office@homemaidclean.co.uk. 10.2 If the Client wishes to contact Home Maid Clean in writing, or if any clause in these Terms requires the Client to give Home Maid Clean notice in writing (for example, to cancel the contract), he can send this to Home Maid Clean by pre-paid post to the following address: Home Maid Clean, 86-90 Paul Street, London EC2A 4NE and/or via email: office@homemaidclean.co.uk. If Home Maid Clean has to contact the Client or give him notice in writing, Home Maid Clean will do so via e-mail or by pre-paid post to the address that the Client provided in the Order or he has otherwise given to Home Maid Clean. Home Maid Clean will need certain information from the Client that is necessary for us to provide the Services, for example, his name, address, contact telephone number(s), email address and payment details. Home Maid Clean will contact the Client about this, whether by email, letter or by telephone. If Client does not provide Home Maid Clean with this requested information, or provides incomplete or incorrect information, Home Maid Clean may make an additional charge of a reasonable sum to cover any extra work that is required, or may suspend the Services by giving the Client written notice. 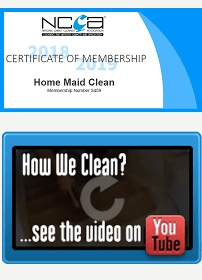 Home Maid Clean will not be liable for any delay or non-performance where the Client has not provided this information to Home Maid Clean after we have asked. (c) inform the Client about similar products or services that Home Maid Clean provides, but he may stop receiving these at any time by contacting us. 11.2 The Client agrees that Home Maid Clean may pass his personal information to credit reference agencies and that they may keep a record of any search that they do. 11.3 Home Maid Clean will not give his personal data to any other third party, other than to our cleaning operatives and anyone assisting us in the performance of the Services. 11.4 Home Maid Clean reserves the right to record all telephone conversations for training, quality control, record keeping and fraud prevention purposes. 12.1 Home Maid Clean may transfer our rights and obligations under these Terms to another organisation, and Home Maid Clean will always notify the Client in writing if this happens, but this will not affect his rights or our obligations under these Terms. 12.2 The Client may only transfer his rights or obligations under these Terms to another person if Home Maid Clean agrees in writing. 12.3 These Terms and each Order constitutes the entire agreement and contract between the parties and the Client acknowledge that he has not relied on any statement, promise or representation made or given by Home Maid Clean or on our behalf which is not set out in that contract. 12.4 These Terms and each Order apply to the contract between Home Maid Clean and the Client to the exclusion of any other terms that the Client seek to impose or incorporate, or which are implied by trade, custom, practice or course of dealing. 12.5 This contract is between Home Maid Clean and the Client. No other person shall have any rights to enforce any of its terms. 12.6 Each of the clauses of these Terms operates separately. If any court or relevant authority decides that any of them are unlawful or unenforceable, the remaining clauses will remain in full force and effect. 12.7 These Terms are governed by English law. Home Maid Clean and the Client both agree to submit to the non-exclusive jurisdiction of the English courts. 13.1 We are Elitom Limited t/a Home Maid Clean, a company registered in England and Wales under company number 07133298, with our registered office at 86-90 Paul Street, London EC2A 4NE.